my mother called in the afternoon, asking me when i was coming by the cafe to pick up my keys and the pastries we bought in quincy yesterday. i was in no hurry, but gave me a chance to pick up some daikon radish for my upcoming kimchi recipe and give the wifi smart plug to my father who wanted to see the power consumption of the freezers. it was another cool day, with highs in the 60's, but by tomorrow we will be in the 80's for a few days. when i got to the cafe, i couldn't set up the plug for some reason, after multiple resets. 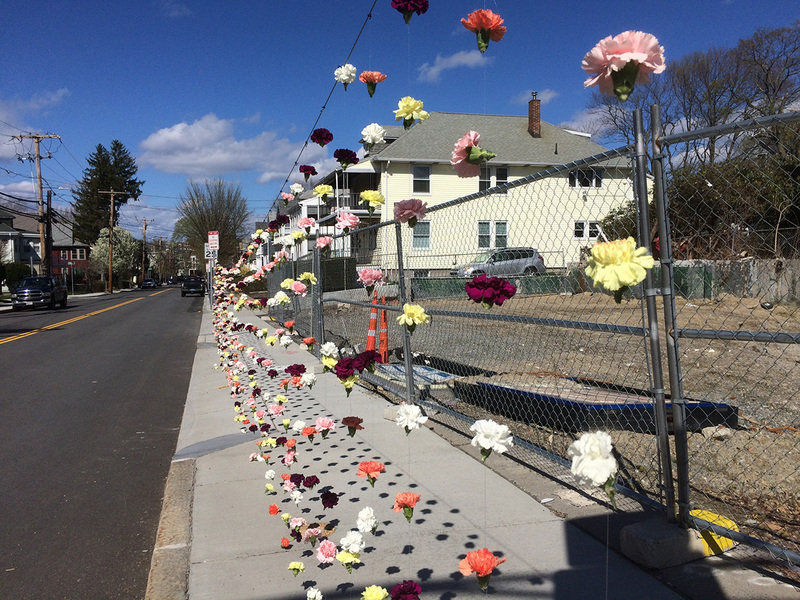 for some reason there was some sort of art installation on a stretch of sidewalk facing the demolished gas station, strands of stringed carnation flowers of various colors forming a curtain. 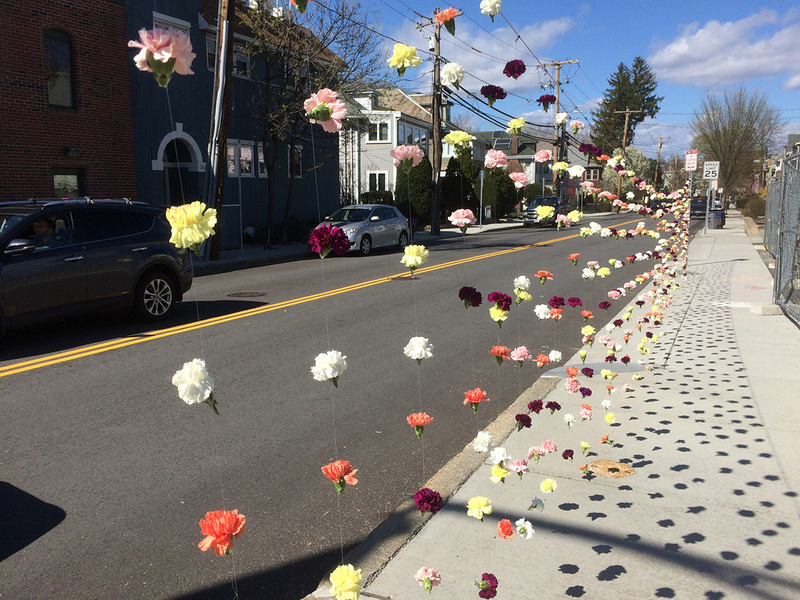 was it really art for art sake, or was it to block the ugly view of the empty lot? 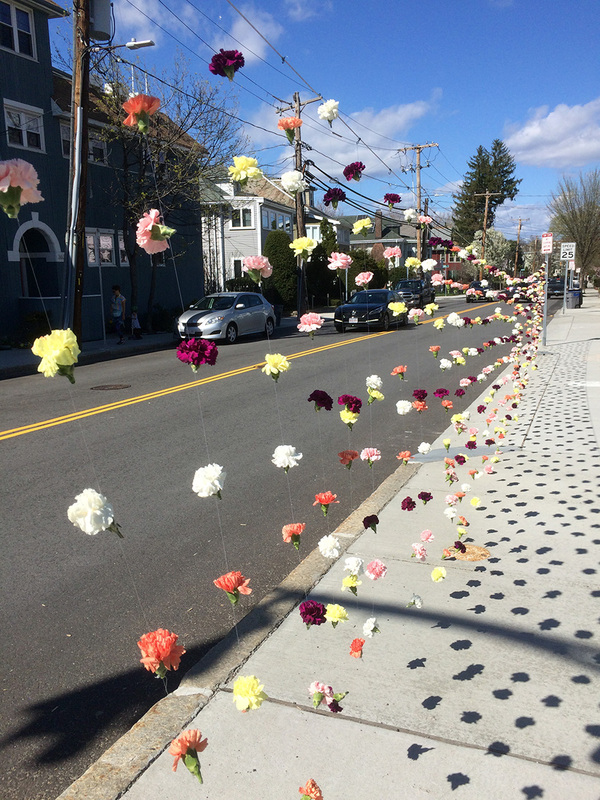 i think it looks cool, but i would've gone with fake flowers, last longer; these fresh carnations will wilt eventually and won't look very good. 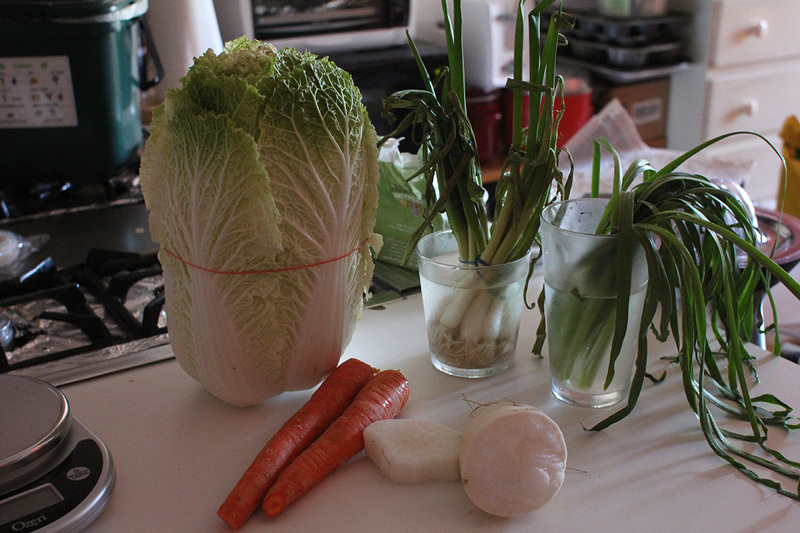 back at home, i didn't start making my new batch of kimchi until 4:30pm. 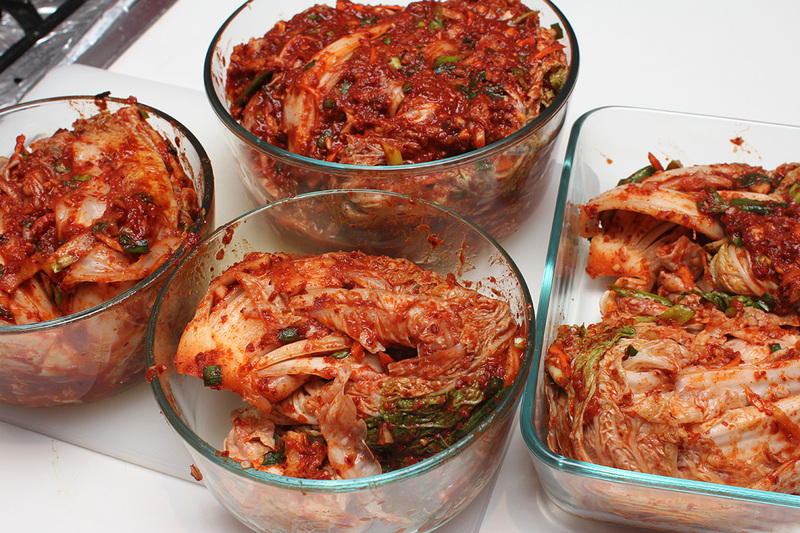 unlike the kimchi i usually make - which is pretty good if i may say so myself - i wanted to up my kimchi game. 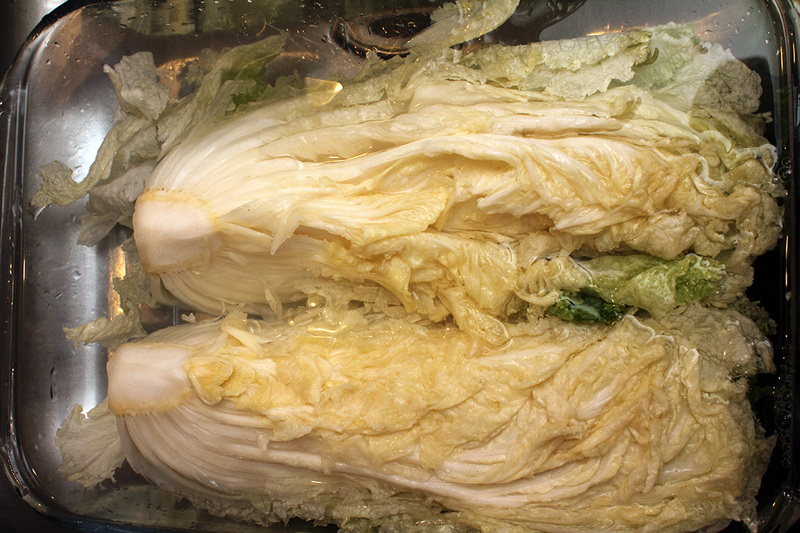 the kimchi i have in korean restaurants are always made from whole cabbages, cut to serve. 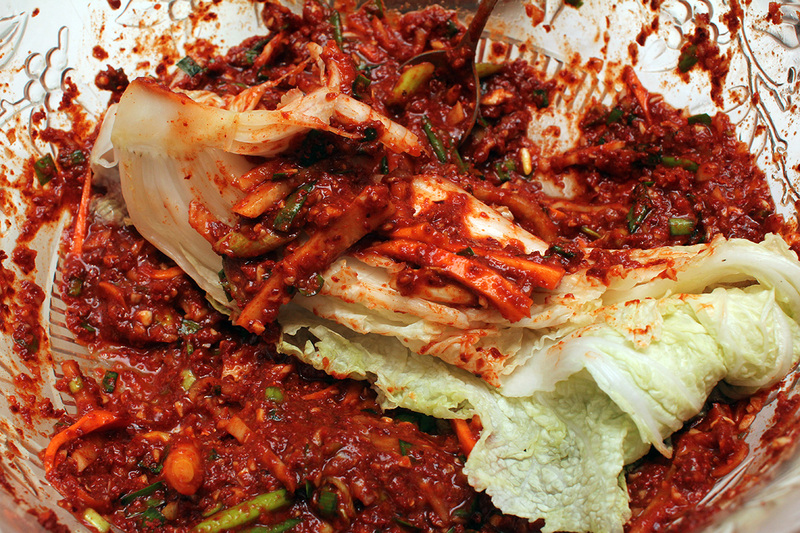 that seems like the more authentic version of kimchi and i wanted to give that a try. 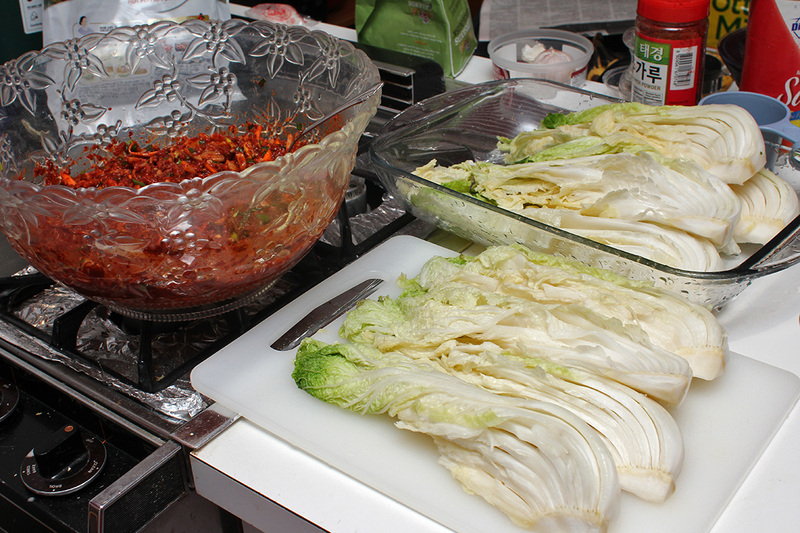 i knew it involved making a chili paste, then coating each cabbage leaf before allowing it to ferment. i followed maangchi's recipe for tongbaechu-kimchi. she's got some great korean recipe videos on youtube, and i've seen a few with my mother, but neither of us have ever tried one of her recipes until now. the original recipe called for 6 lbs. 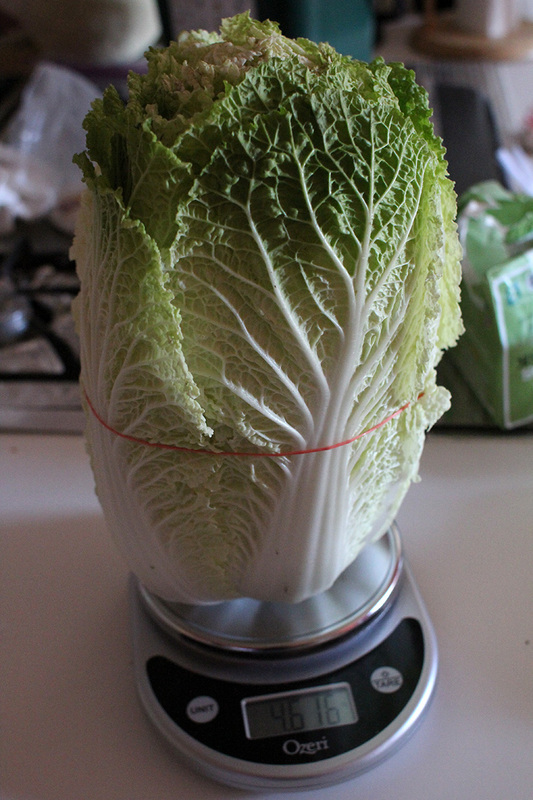 of napa cabbage (about 2 medium cabbages) but i only had 4.61 lbs. instead of reducing the ingredients proportionally, i just followed the recipe as is, figuring it wouldn't be a bad thing if i ended up with more chili paste. 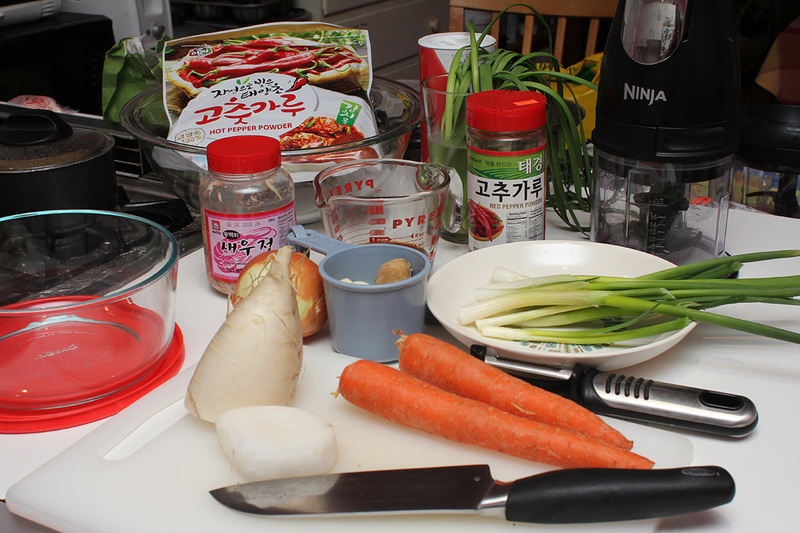 almost all the ingredients are for making the chili paste, which is where most of the taste comes from. 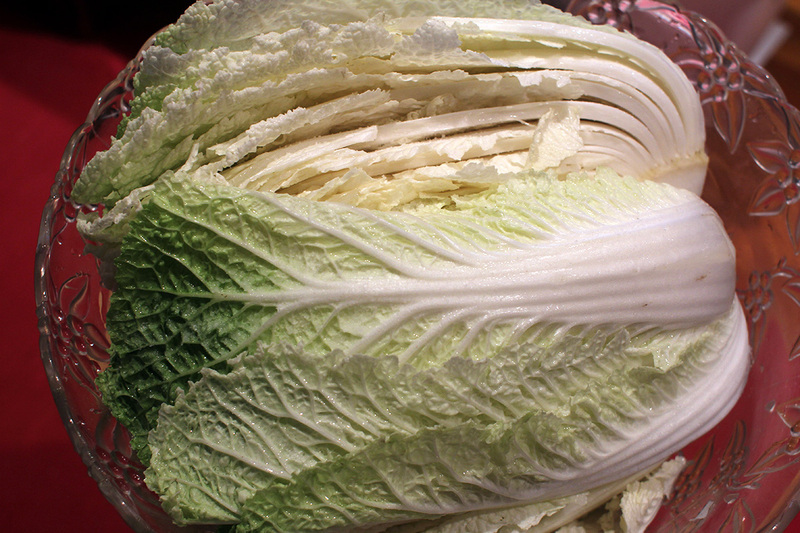 i quartered the napa cabbage, using the technique of scoring the end of the cabbage and then carefully prying the two halves apart. 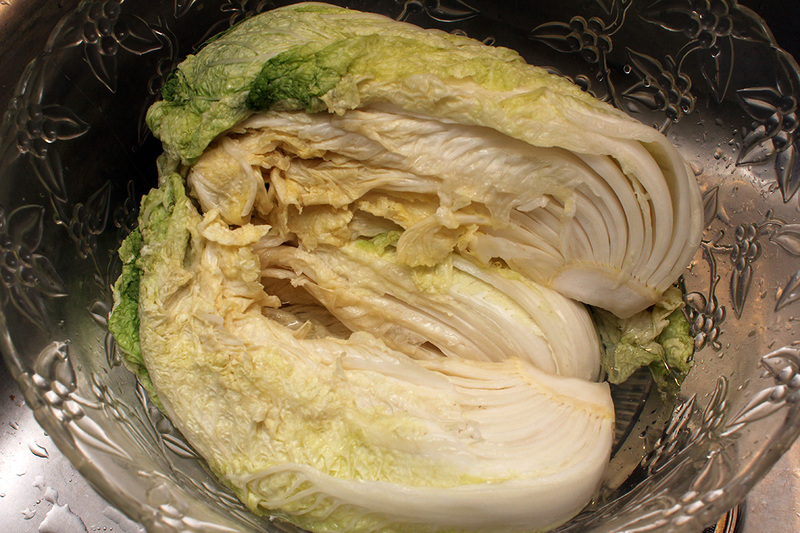 in retrospect, it would've been better to cut the portions clean through with a knife; i found when i split it by hand, it tore the cabbage leaves unevenly. after washing the 4 quarters, i began salting. the video showed the salt was sprinkled, but i forgot and applied the salt with my fingers, which ended up taking more salt. 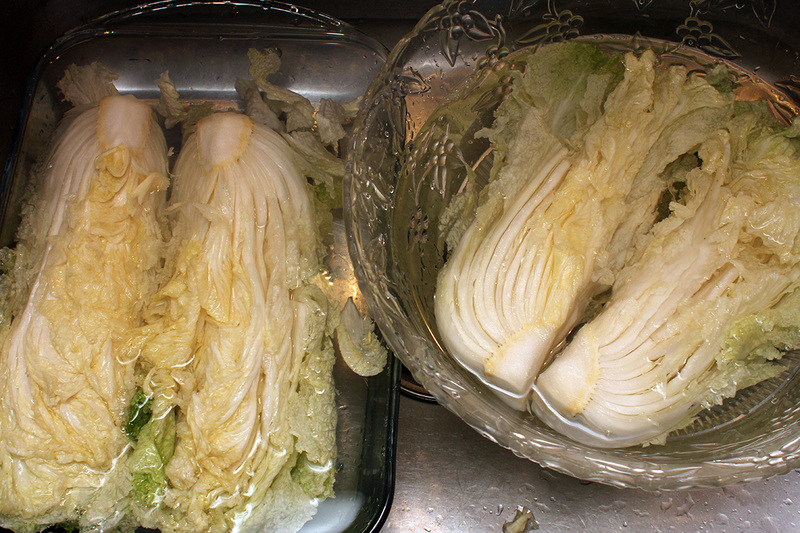 i then left the cabbage to reduce, turning them over every 30 minutes. 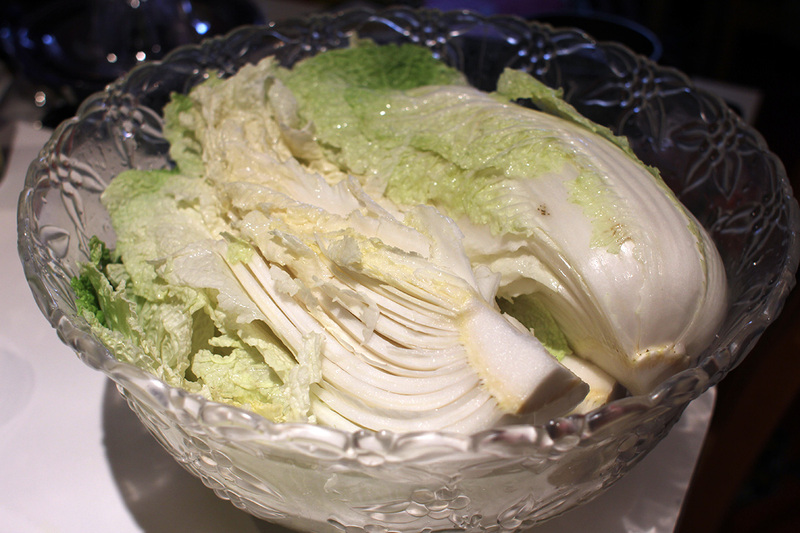 i realized i need a bigger bin (one of those large plastic basins sold in asian supermarkets), i didn't have a good receptacle to let the cabbage reduce; in the end i used my plastic punch bowl. 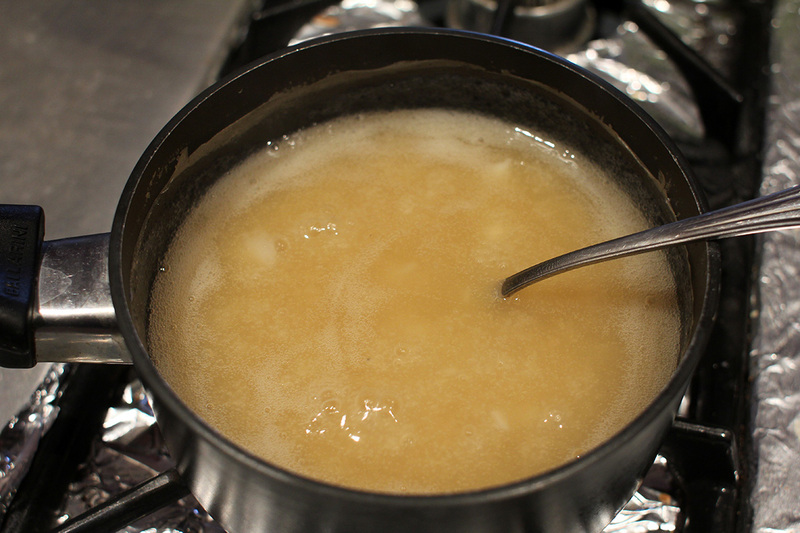 while the cabbage was reducing, i began making the chili paste, which starts with boiling a glutinous rice soup, adding some brown sugar at the end. 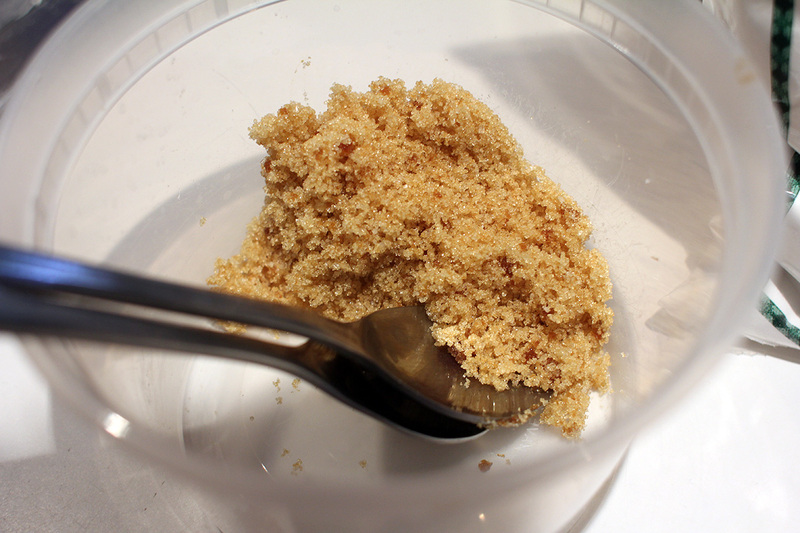 i didn't have any brown sugar but made my own by mixing 2 tbsp of white sugar with 1/2 tsp of molasses. i left the mixture to cool with the lid on. at one point i tasted the soup, it was actually pretty good, reminded me of some dessert i've had in the past but couldn't exactly remember. i ended up reducing the cabbage for 2-1/2 hours. 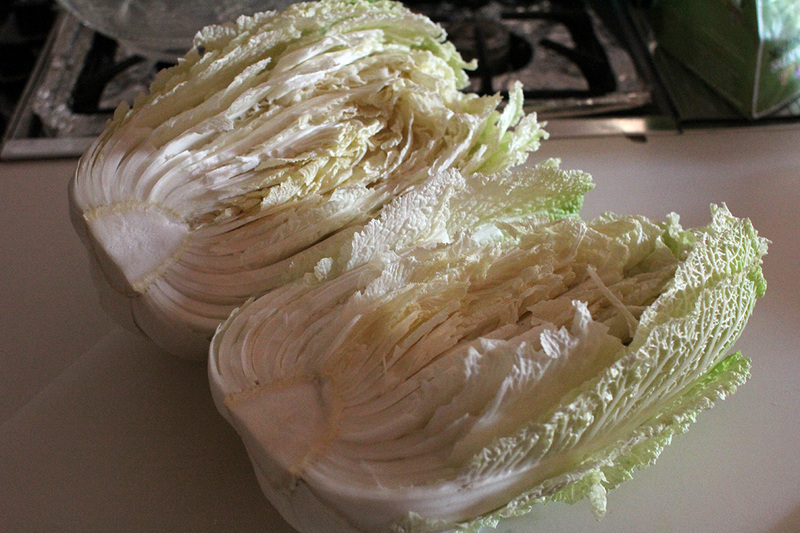 a unique thing with this sort of kimchi recipe (whole cabbage) is that the salt is used only for reducing. 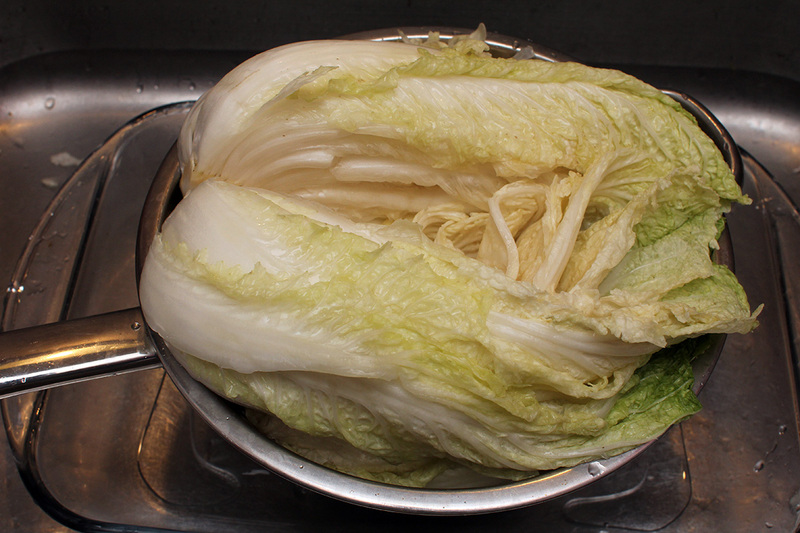 instead of keeping the cabbage brine, we actually rinse and wash the cabbage sections with cold water. 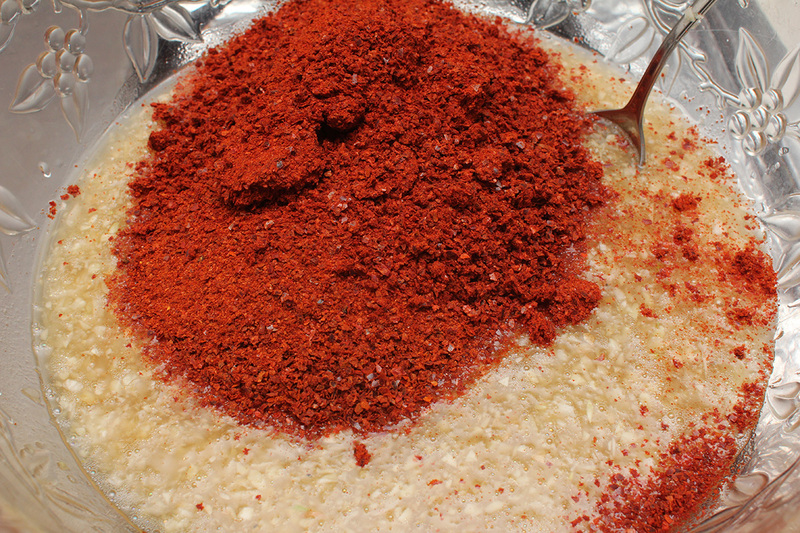 the chili sauce isn't just sweet glutinous rice porridge mixed with korean chili power: it also contains a good amount of vegetables ingredients. 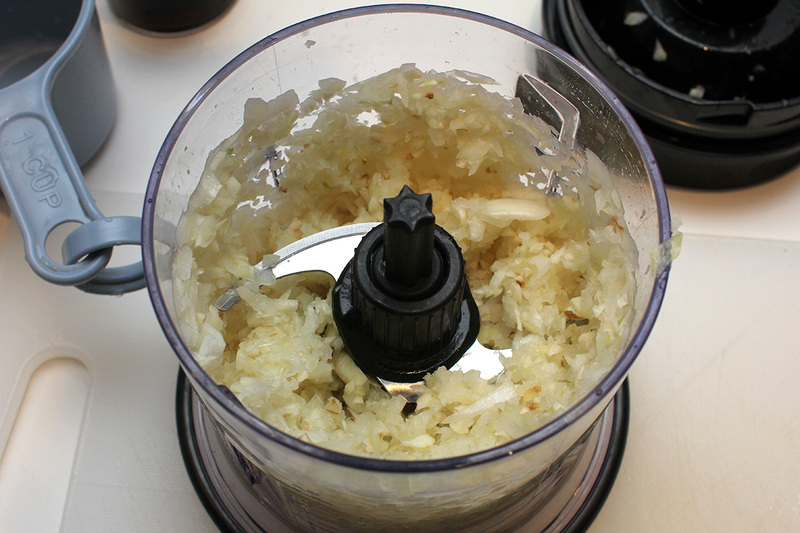 the garlic, ginger, and onion are first processed in a food processor. 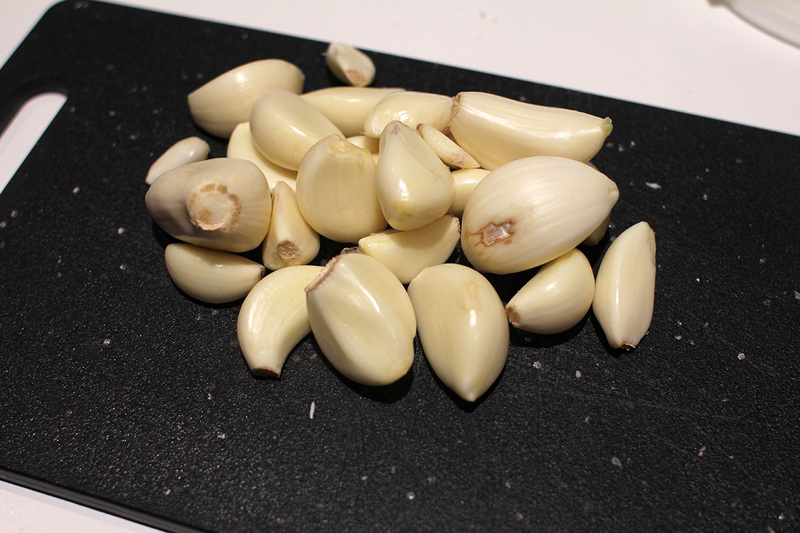 i peeled way too much garlic than i actually needed (just 1/2 cup). 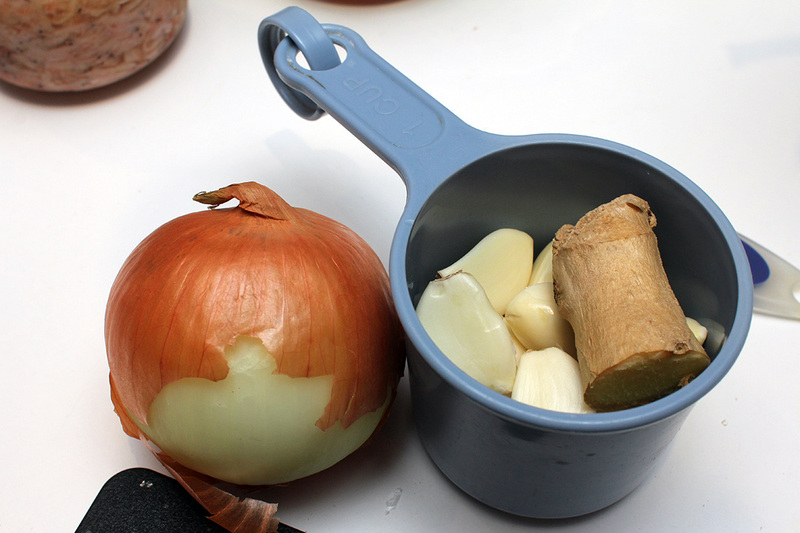 as for the ginger, this recipe calls for just a small amount - the length of 2 finger knuckles - when in my past recipes i put in way too much where the final flavor has a very strong ginger taste. i didn't bother peeling the ginger since it was getting processed. in my typical kimchi i also like to process an asian pear - kind of like my secret signature ingredient, adding a hint of sweetness. but i didn't do it this time because the glutinous porridge already had sugar added. depending on how this recipe taste, i might add asian pear next time. 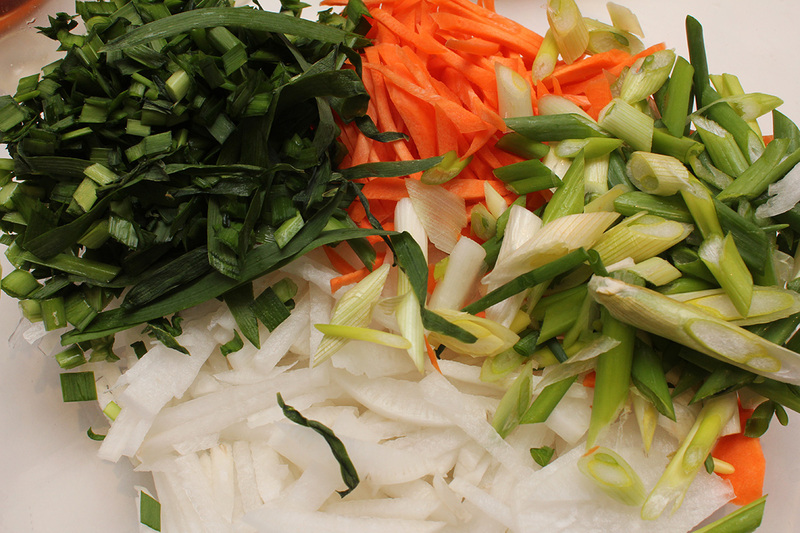 i chopped the remaining vegetable ingredients: cut the daikon radish and carrot into matchsticks, chopped the garlic chives, and diagonally sliced the scallions. i was using old scallions that'd be in the fridge for weeks, good to be finally using them. another thing i wasn't adding were thai chili peppers. i normally like to add some for additional spiciness as the chili powder itself - though looks spicy - actually isn't. 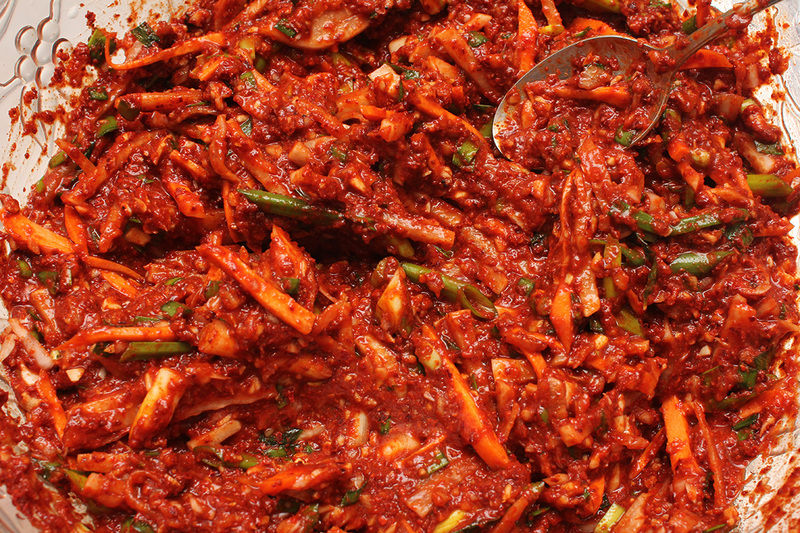 once again, depending on the taste of this kimchi batch, i may decide to add chili peppers next time. 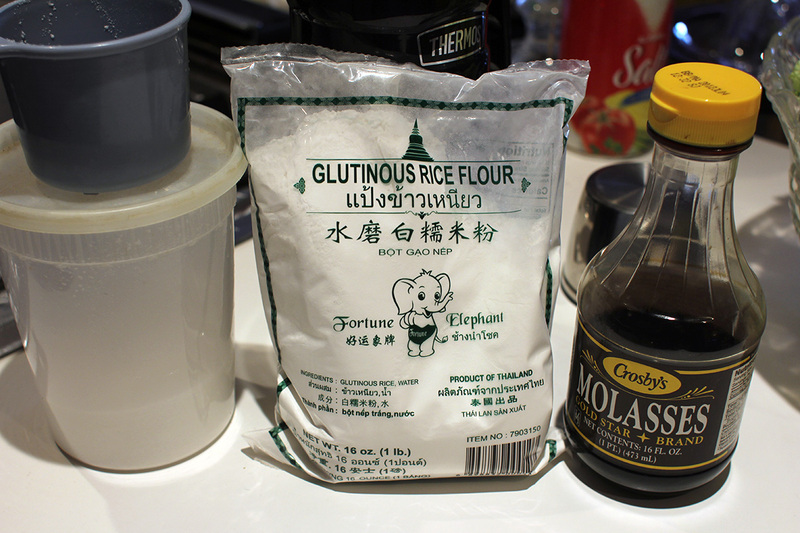 recipe also asked for 1/2 cup of fish sauce. would this make the kimchi too fishy tasting? in the past, the only fishy ingredient i added was the shrimp paste. 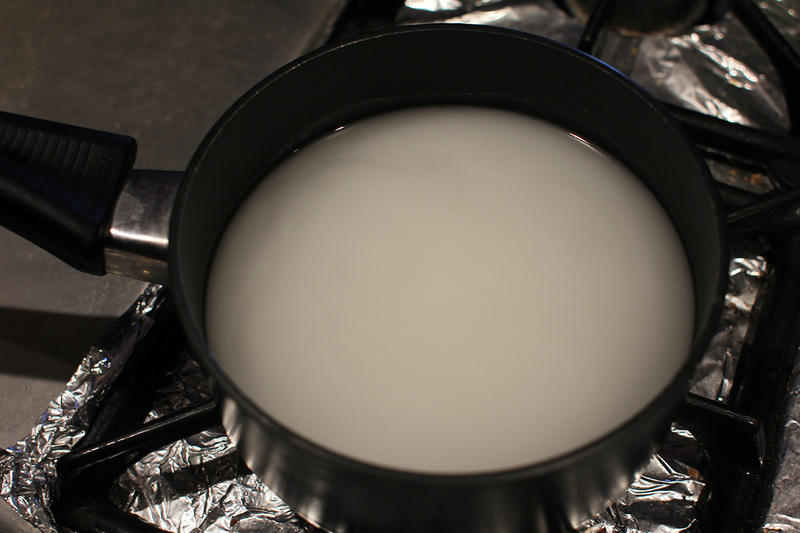 but adding fish sauce made sense from a taste perspective, adding an additional complexity and savoriness. the fish sauce would also add back some of the salt that'd been washed away earlier. 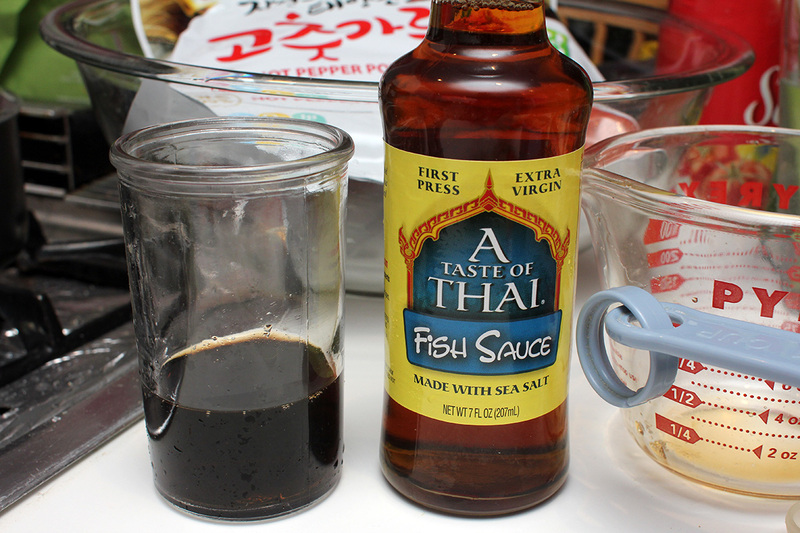 i had some old fish sauce but only 1/4 cup after emptying the jar. i quickly ran to star market to get a fresh bottle. there were 3 different variety in the asian food aisle, i went with the 2nd most expensive bottle, around $3. only when i got back home did i notice how black my old fish sauce. does fish sauce expire? i didn't want to find out, so decided to just use the new sauce instead. 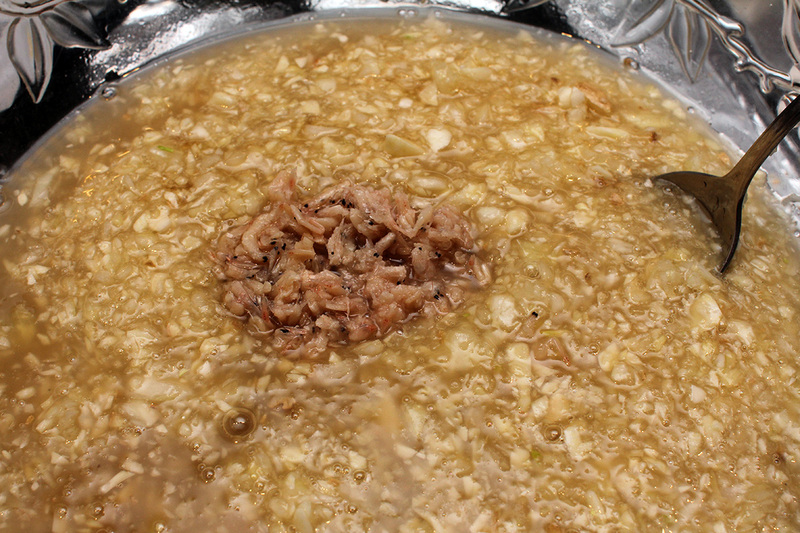 i then blended together all the chili sauce ingredients: sweet glutinous rice porridge, processed ginger-garlic-onion, 1/2 cup of fish sauce, and 1/4 cup of chopped shrimp paste. i almost made a mistake by adding too much shrimp paste (1/2 cup) before i reread the recipe and caught it just in time. next came 2 cups of korean chili powder. 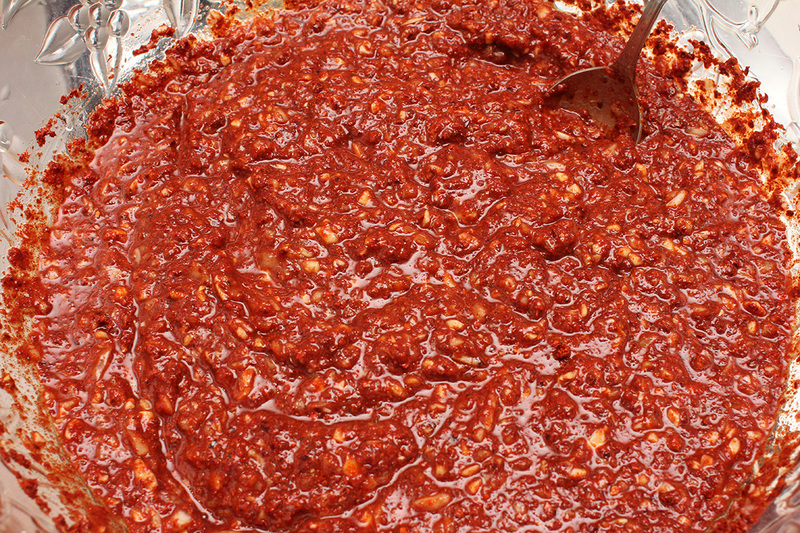 it didn't look like much at first, but after i blended everything together, it became this beautiful red paste. 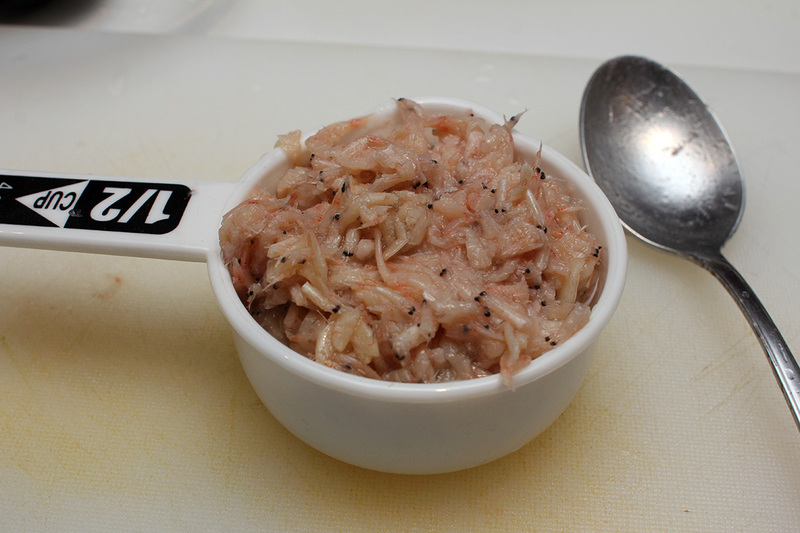 i tried a sample, so good, a complexity of flavors, and a surprising crunchiness from the shrimp shells. maybe i could stopped there but there was more as i added the chopped vegetables, resulting in a thick chunky sauce. 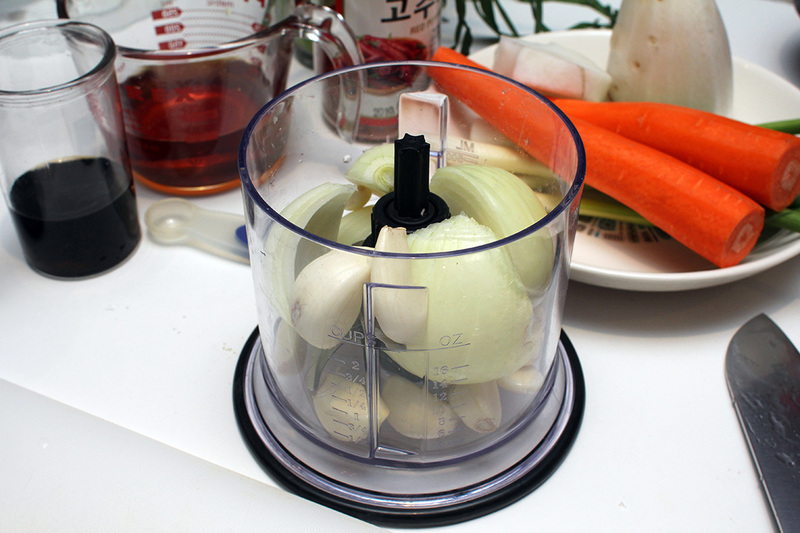 i must've missed a step, because the instructions said to score the cabbage quarters before reducing. why? 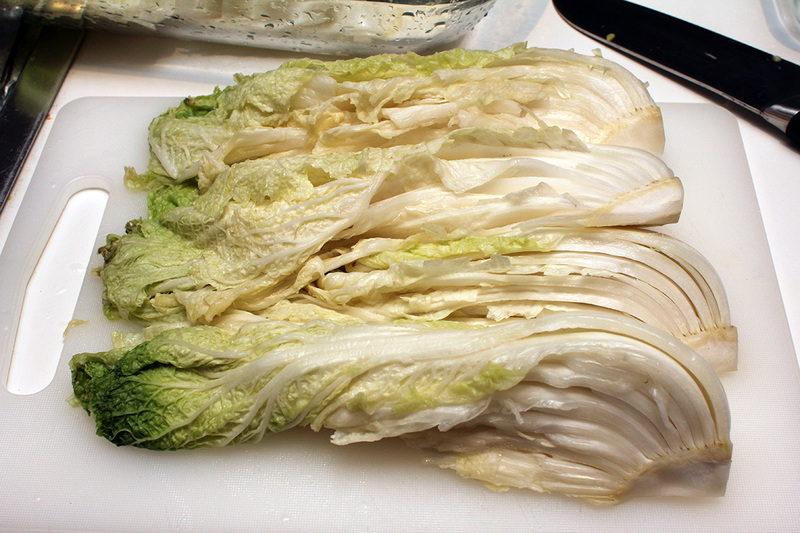 because afterwards you're supposed to split the quarters, resulting in 8 pieces of floppy napa cabbage. i just scored it afterwards, then pulled them apart by hand. 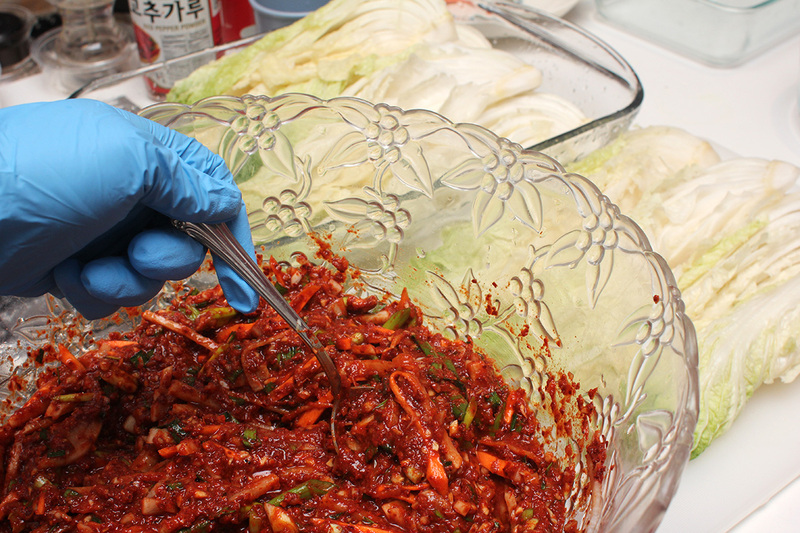 i put on gloves before applying the chili paste to each individual cabbage leaves. the first few i did i put way too much paste, and it was starting to look like i wouldn't have enough to finish the rest even though i made extra amount of paste. i also did really have a good container, and ended up using all my pyrex bowls. 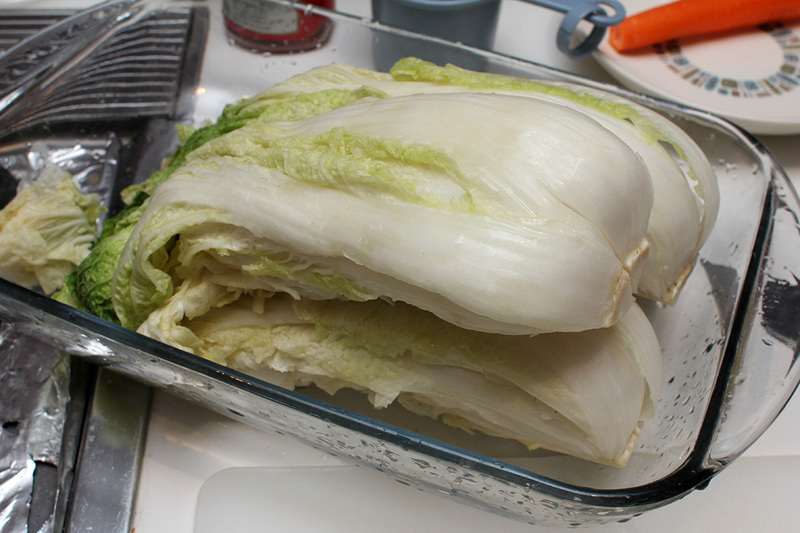 after slathering each cabbage piece with paste, i then curled up the cabbage into a tight bundle. the final few cabbage pieces had less sauce, but i had just enough to coat all of them. 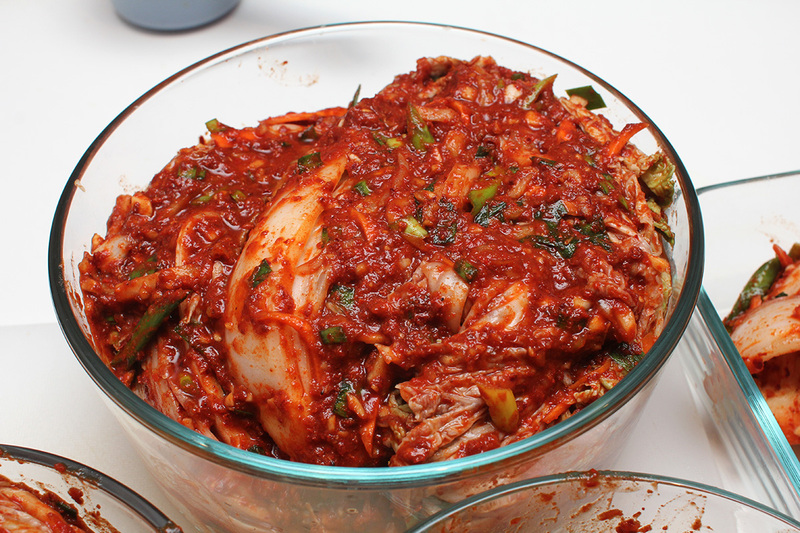 i then left the tongbaechu kimchi to ferment on the countertop. instead of using the pyrex lids (i didn't want to stain them with kimchi flavors), i covered the bowls with syran wrap. now in 2-3 days everything should be fermenting and i can move everything into the fridge. 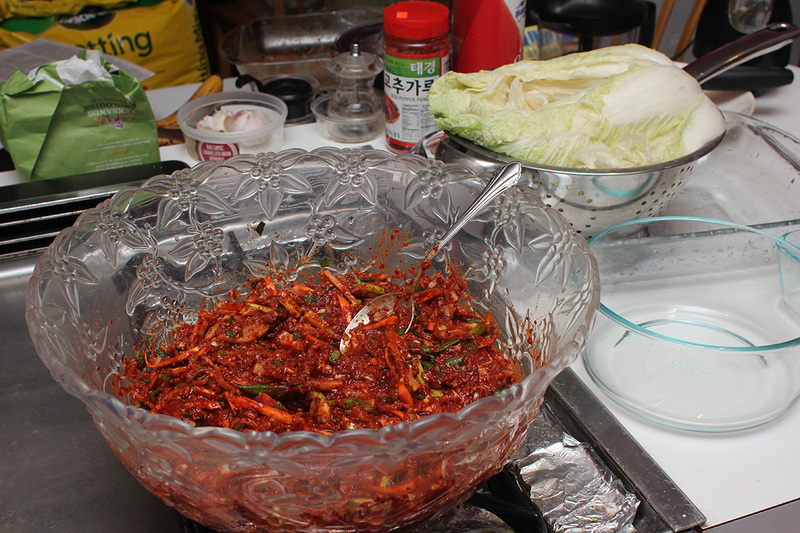 i started making the kimchi around 4:30pm and finally finished by 9pm, 4-1/2 hours later. today's solar production graph reminded me of a vulcan salute. we made 41.03 kWh, which wasn't a record, but a good start for the month of may. for dinner i heated up my final slice of baked ziti. i ate while watching a new episode of for the people.